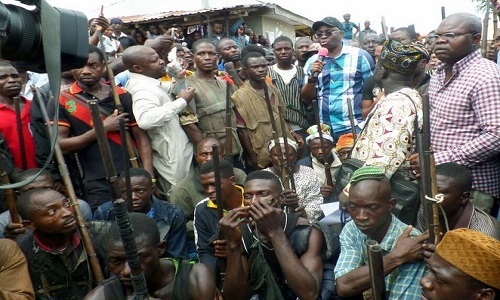 The Governor of Ekiti State, Mr. Ayodele Fayose, monday declared war on the rampaging Fulani herdsmen by placing ban on free grazing in Ekiti while also ordering the security agencies and local hunters to gun down herdsmen seen terrorising the people. 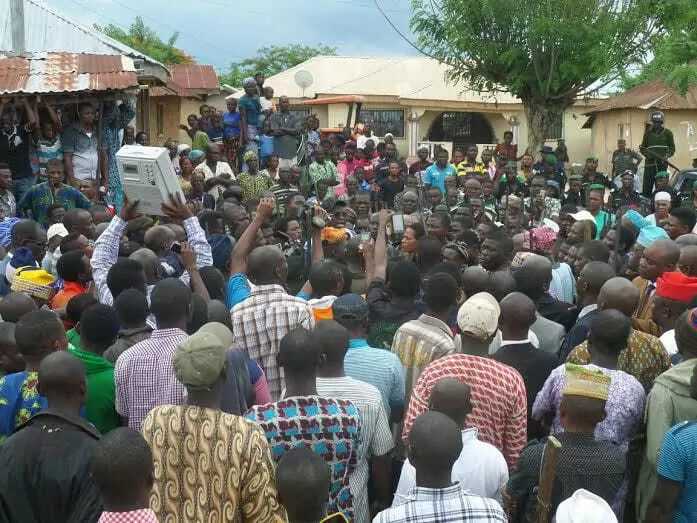 Fayose said this in Oke-Ako in Ikole Ekiti during a visit to the beleaguered town where two persons were reportedly killed by suspected herdsmen on Saturday. The governor, who stormed the town in convoy of about 30 vehicles, was escorted by the state Commissioner of Police, Mr Etop James, the Director of the Department of State Services (DSS), Mr. Andrew Iorkay and Commander of the Nigerian Security Civil Defence Corps (NSCDC), Mr. John Ikemefuna. Due to the lethal attack, the town still seemed deserted why soldiers, anti-riot policemen and men of the NSCDC were seen in strategic places in the town to ward off further attacks. Fayose donated a hilux van and the sum of N5 million to the local vigilante group operating under the auspices of Association of Ekiti Hunters to be able to defend the town while also donating a sum of N2.5 million to the families of the deceased. The governor, who said a bill criminalising grazing would soon be passed into law in the state House of Assembly, also ordered that communities should henceforth confiscate cattle found on sight. He said henceforth, those interested in cattle farming should get their own private cattle ranch. He warned that government would henceforth confiscate any cattle seen anywhere in the state apart from ranch created for them by their owners. He described the Fulani herdsmen that attacked Oke-Ako and other communities in the country as Boko Haram members making tacticalintrution into the South-west.